Many people want to convert from Maximizer to Goldmine, but there has been no easy way to do it, without retyping the data. 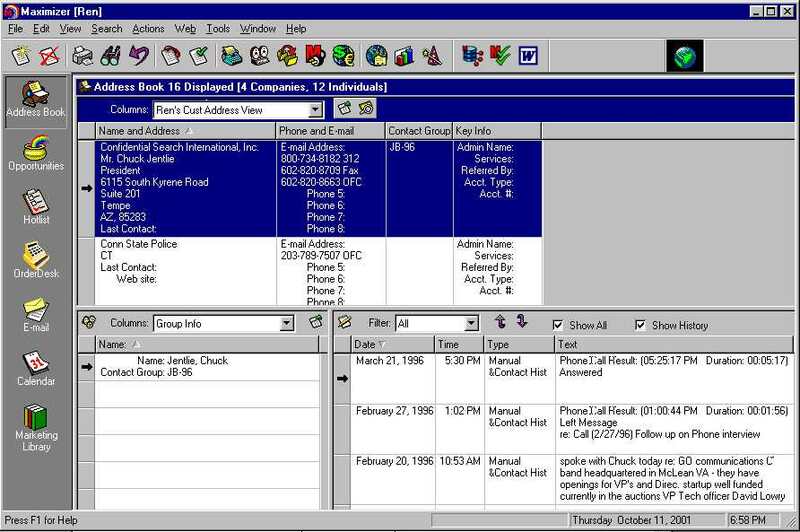 The Maximizer.Map file provided inside the Goldmine Import feature only brings in the Contact data (and no secondary contacts), without the important activities (calls, meetings, todo's), history, notes, groups, or email addresses. So, you're only left with basic rolodex information. "History was history." 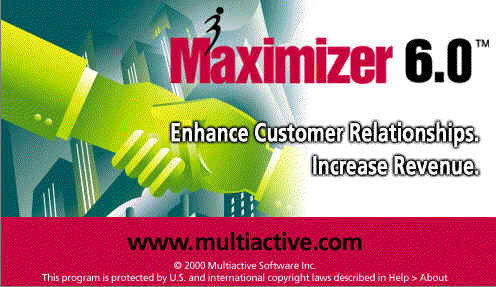 But you need to benefit from your many hours of data entry with Maximizer. Beneath the similar user interfaces of Goldmine and Maximizer, are some complex tables, index keys, and data relationships. Goldmine and Maximizer store their contact data in different ways, using differing fields and approaches. GoldMine's complex .BLB file is especially challenging to work with, which stores user information, notes, and attachment references. One small error, and the file is corrupted. This is perhaps why no one has yet created an effective data conversion program. For years, Maximizer enjoyed the strategic advantage of being able to almost completely convert data from Goldmine - while Goldmine was unable to do that in the other direction. Once an Goldmine database was easily assimilated into Maximizer, there was no way back. We do a lot of this type of conversion, and have refined the process down to about 3-4 hours. We've put the data back and forth between GoldMine and Maximizer many times over the years. Usually we do the job overnight, so people can leave off with Maximizer one day, and start with GoldMine the next day. As different organizations use Maximizer and Goldmine in different ways, we would like to have a phone number to call someone familiar with your database, just in case we have questions about unusual particulars during the conversion. How do you send to GoldMineConvert the files to work on? If your company has an FTP site, we can download and upload it there. You will need to supply us with a login and password. Either way, your data is kept in the strictest confidence. Which files do I need to send? A complete list is included at the above link. A MaxZip.Bat file, placed in the Maximizer EXE folder, will get the proper files automatically. Or, you can create a compressed "Zip" file on your own. Please do not send the C:\Maximizer\MAILBOX\ATTACH folder, as this may have hundreds of Word processing, Excel spreadsheet, and PowerPoint files. These do not need to be converted, and only make the Zip file larger. This makes it take longer to send your files to us. How do you receive the converted Goldmine Database? When we are done with the process, we will call and send you an email with the GoldMine_DATA.ZIP file attached (if it is a small database), or a link to download the file with your browser. For your security, this folder will be have an unguessable name. In addition, we will encrypt the ZIP file. We want zero chance that anyone else will get your data. Our Consulting Rates - Usually the job takes about 3-4 hours, for about US$ 200-300. Which aspects you want to convert to Goldmine For example, perhaps you don't care about the Groups. We can provide you an estimate at no cost or obligation. For some clients, we do the conversion on a weekly basis at a substantial discount. For example, a salesman who likes to use Maximizer, can send his database to his Sales Manager who uses Goldmine for activity analysis. This way they are both happy. Each conversion improves the process as more and more of these limitations are overcome. Can I buy the program? We have been working to develop a generic software package that "does it all" but this has proven difficult as there are a surprising number of variations in the way people use Maximizer and Goldmine Plus, the GM data is not always in the right place and may require some cleanup preparation. It's the exceptions that require special data handling. The process still involves a number of expensive different programming tools which must be bought from software companies. This list does not include the all important special programs and scripts written to make the conversion work. So it is best converted by a qualified database technician who already owns and has experience with these tools. Even if we were able to create one conversion program, you would probably only need it for a one-time run. The program (and possible technical support) would cost more than our service work to do it, anyway. You might not use these database tools again and they would sit on your shelf. We take care and run cross checking routines to verify that the data has converted properly. We know what to look for. The process is getting better and more refined just about every day. So you benefit from the latest refinements. How is this different from what Intellisync does? 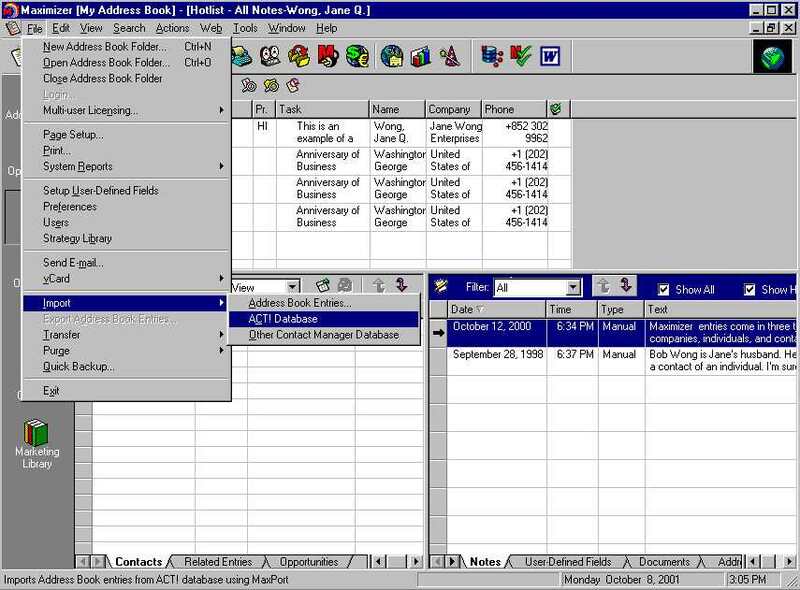 Intellisync can convert most of the contact data, and activities for Palms, and other simple rolodex systems. But, unlike Intellisync, we also retain the relationships - the way a contact relates to the activities, groups, histories, and notes. After an Intellisync conversion, the contacts, activities, groups, histories, and notes are separate entities. We also have received very positive feedback from Goldmine Certified Consultants and commendation from Interact Commerce Corporation senior executives from around the world. This has "evened the playing field" with Maximizer, which was long able to convert from Goldmine Before Maximizer was able to assimilate Goldmine files, but not vice versa. Now Goldmine can convert from Maximizer equally well. Why doesn't Goldmine include a better Maximizer importer with the software? That is a good question. If Goldmine did, we would not have bothered developing the procedure. or Pervasive.SQL, Sequitter Codebase, Microsoft Visual Studio and ZedTek's ZTreeWin. This would be too expensive. It may come down to one word: "BLoB." GoldMine's BLB file stands for "Binary Large oBject." This is where the Notes, Email addresses, Attachment paths, Passwords, Usernames, etc. are stored. Blob is a good name for it. It is a complex file, and one wrong byte corrupts it. So special care must be taken to ensure the information from Maximizer goes into the right place. The conversion process takes more than a simple MAP file. 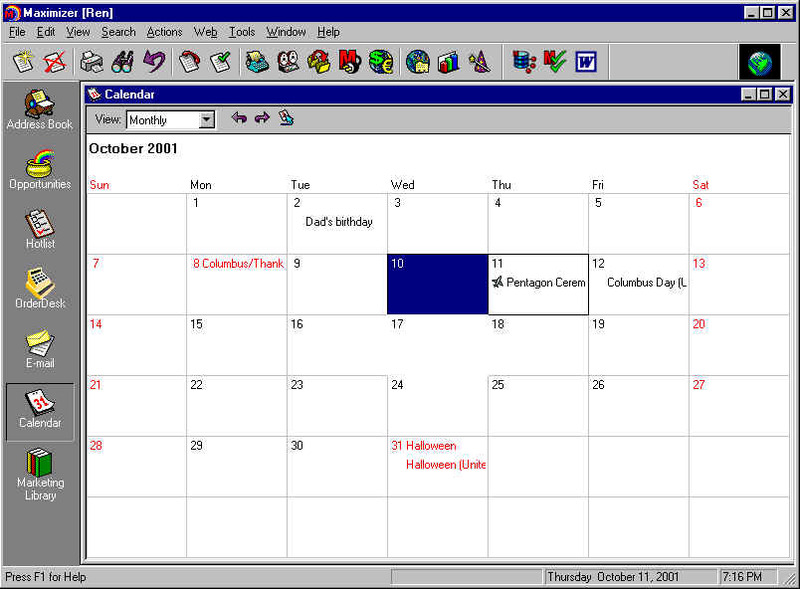 Other programs, such as Outlook, can be easily imported. It is just a matter of matching the fields from one data file into Goldmine's structure. But Maximizer's data structure is not that simple. Another reason is Maximizer's unusual field use. Maximizer uses its fields in quite unusual and let us say, creative ways. For example, in Maximizer's CONTSUPP.DBF file, the Address and City fields are sometimes are used for secondary contacts. But at other times, these fields are used for the "address" of a linked document template! At other times, for an email address. This is too inconsistent for standard import procedures. We are familiar with such idiosyncrasies, and take care of them in our conversion process. We are working to develop something that could be included in the Goldmine product. But it would have to be compact enough, easy to run, and fit well into the Goldmine menu system. That is a challenge in itself. So, for now, it is a special process. As our Chief Contact Converter, he has been both an Goldmine Certified Consultant (1992 - 2001) and Maximizer Business Partner. 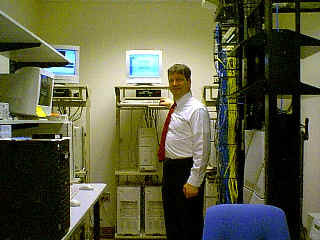 He has achieved certification in other contact managers, and as a Microsoft Certified Professional. He has proven himself in the field, handling hundreds of clients, taken the required advanced seminars, and passed the exams with the highest marks. Dr. Shaddock (PhD in Computer Science) did his graduate work and dissertation on relational database modeling theory. He is proficient with the programming tools needed to develop the process: GoldMine SDK, CodeBase, Btrieve, Open Data Base Connectivity (ODBC), Structured Query Language (SQL), Microsoft Access and Microsoft Visual Studio - including Visual Basic and Visual FoxPro. In order to accurately and objectively advise our clients which is best, C I Corporation puts its own company database in one or the other, when a significantly new version comes out in Goldmine or Maximizer. We want to keep on top of the latest features of all the major contact managers, and be able to compare and contrast them. This way we can speak from years of daily hands-on experience. Clients asked "Why is Goldmine better than Maximizer?" We wanted to be able to give an experienced answer. Some consultants can only offer advice about the one program they are certified in. At C I Corporation, we do our best to try all the major options, and compare and contrast them, in order to call ourselves consultants. Like you, when it is time for a switch, we want to retain all our precious notes, groups, and history records. The conversion procedures included in Maximizer and Goldmine do not completely convert their competitor's format. A lot gets lost in the translation. So, out of necessity, we have developed programs and procedures over the years to help us convert quickly and completely. We are experts in what is happening at the deep file and table relationships level. Since 1992, we were quite satisfied with Goldmine and may never have tried, much less mastered Maximizer, except for a temporary difference of opinion years ago with Symantec Corporation, which used to market Goldmine But it proved to be a fortunate thing for Goldmine that we looked in to competing products and developed conversion processes. Goldmine and Maximizer each have their strengths and weaknesses. They are suited to a particular type of user or organization - playing to different audiences. They are both good for different reasons. With each version they each expand in their capabilities. (Is that statement political enough?) But we find that 99% of clients we find want to convert from Maximizer to Goldmine - instead of the other direction, due to Goldmine's user-friendliness. Maximizer has more features, but is generally considered is harder to learn than Goldmine Some organizations have found the the users do not use those features anyway. If they features aren't used, they don't really exist for the user. GoldMine is a program that a person new to computers could easily use. Here is a comparison from Interact. What about Goldmine to Maximizer conversions? Maximizer pretty well has that taken care of with its own menus. We offer training and consulting in contact management and other popular business software. Please click on the following links, or feel free to call with any questions. Can I see a sample of a Maximizer database converted into Goldmine?